Mug Holds Up To 15 oz. 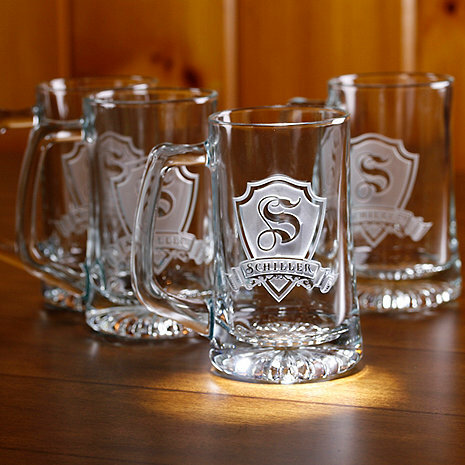 Our Personalized Shield Beer Mug is custom engraved with an old world european style shield featuring a monogram initial in the center and an elegant name banner engraved under the shield. Our custom beer mug set is the perfect groomsmen gift, birthday or wedding gift. Our master glass carvers deeply carve each glass using our sand carving technique, so that each of our beer mugs is meticulously custom made to order making it the perfect gift for those seeking unique gift ideas for beer lovers. At 5.75" high x 3" wide, our beer mugs hold 15 oz. Dishwasher safe. BEST ANSWER: Thank you for your question, these are only available in the sets of 4. Can these glasses be placed in the freezer for chilling? BEST ANSWER: These we not intended to be put in freezer but they are sturdy glasses. The quality of the mug and the quality of the engraving was phenomenal. I couldn't be happier with the product. The only issue I had was with the shipping. When I wasn't getting an email that it shipped I called in. The rep was very nice and helpful and told me my item would ship by the end of the week and I'd receive an email when it did. This was a present and at the end of the week it was received, not shipped. A week and a half later I received the email that my item shipped. Other than that I would recommend Wine Enthusiast and I will purchase from them again. They arrived and looked just like the pics! Heavy weight glass makes these mugs a long time keeper!